This is the way the Aquarium used to look, and is a document of something that doesn’t exist that way now. It is quite surprising looking back now over ten year old and eleven year old material, to see just how much things have changed. In the main you do get improvements, but always something is lost. Thus these films are particularly precious memories, their bytes outlive the reality they reflect. This was a part of the lovely day in December 2006 in the Warsaw Zoo with Sophie which we saw most of in the previous film. This lovely animal was walked around us before the food was served and we were asked to keep calm. He remained with his handlers at the top stage during117777 the meal, and was continually stroked and petted by these handlers. In addition to seeing the cat, another attraction of the evening was having local tribal markings plainted on our faces using something that looked a bit like Tippex. The scenery from the mountains we saw on the way when visiting the Stellenbosch wine region was also unlike anything I had seen before. South Africa is a wonderful country. Copenhagen giraffe gaffe and how the Daily Topheegrill’s mods are in a world of their own. Greetings from a nice warm spot by the window with a blizzard going on outside, here in Moscow. I had a comment squelched by the Daily Telegrumph Moderator today, but that’s fine. I saved it, and can reproduce it here, where there is freedom of speech. 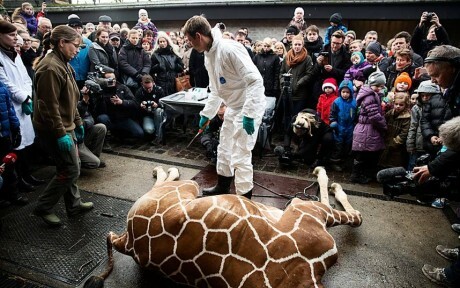 It was all about the fate of the Danish giraffe, Marius, who got ethnically cleansed for not being good enough for the ScandinAryan giraffe gene pool and fed to lions in Copenhagen Zoo as shown below (photo taken from Tumblywhump as compensation for wasting my time – that’s after all what it amounts to when a moderator squelches one of my finely-crafted commentaaages). This was sad because a billionaire in America had offered to take Marius to a retirement home for giraffes in Beverley Hills and given a load of money even for him to Copenhagen zoo, but the director of the zoo was adamant that Marius was for the chop. So unceremoniously they killed him and carved him up and fed him to lions in front of the parents an children visiting the zoo. Evidently there is little freedom of speech in the UK these days as I noted that this gem of mine was quickly removed even though the readers of the Tellygrump had managed to vote it up quite strongly in a short time and retweet it around the internet a bit. None of their readers disagreed or wanted to take issue with it, or vote it down, only to support it or vote it up. So how come their moderators are so out of synch with the tastes and opinions of their readership? Junkalists are the first ones to weep and wail and gnash their smelly teeth when anyone curtails their freedom of the press (which they rarely take proper advantage of anyway) but they will happily curtail that of their own stakeholders the readership with never a care. Thankfully I have my own blog and can have my say anyhow without the by-your-leave of some wannabe Fleet Street hack who got confined to the backroom moderating the online version of the Tuffygroll.